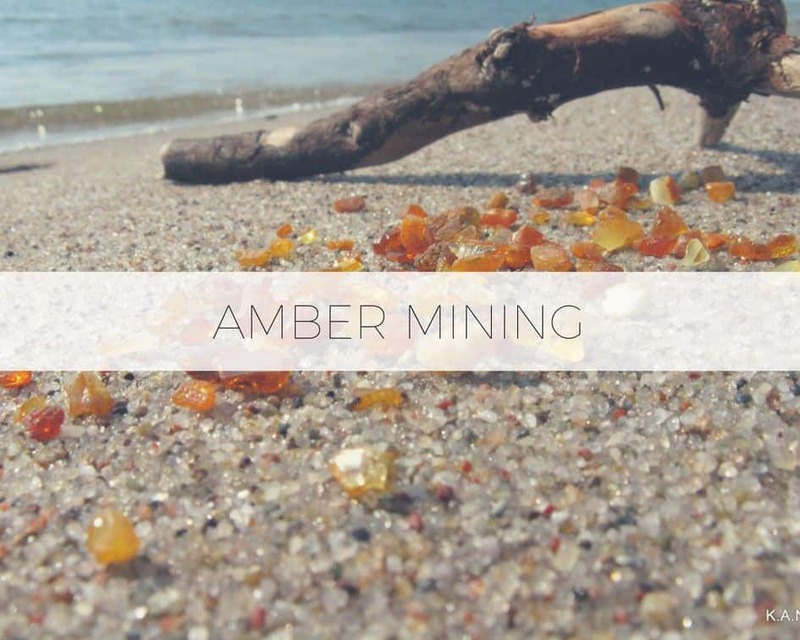 Have you ever wondered how amber is mined? Well, we have an answer for you. And even more! 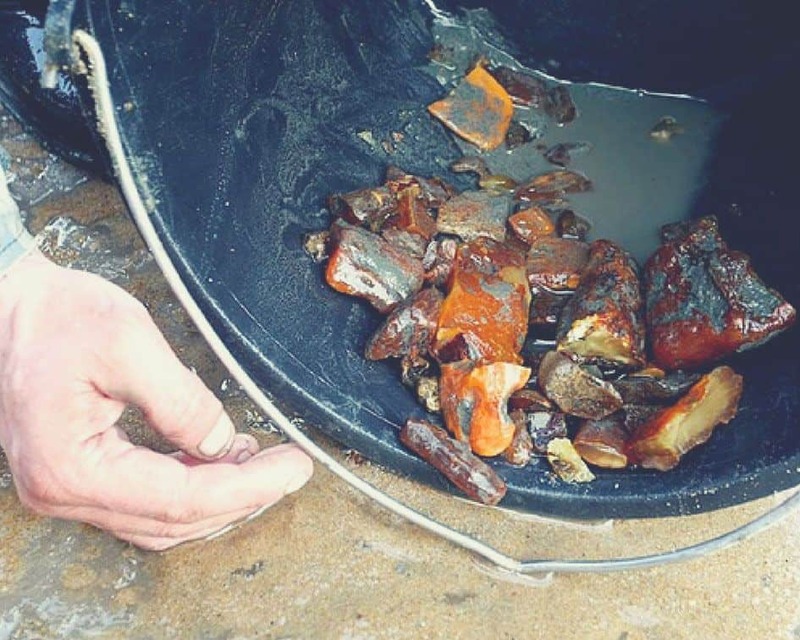 In this post, we will explain you not only about the methods of amber extractions, but also will tell where to try catching amber by yourself without the use of any special equipment! 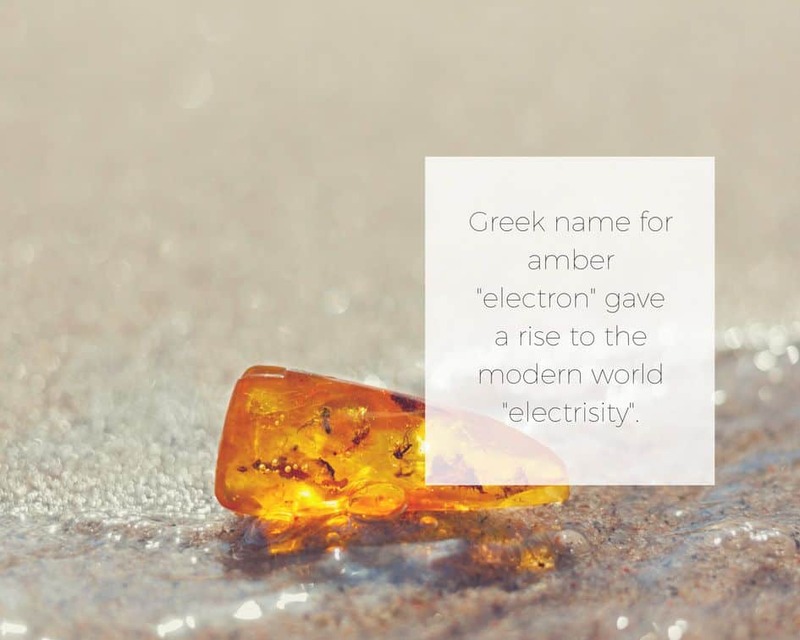 Amber has been a highly-valued material since earliest times. Worked amber dating back to 11,000 B.C. has been found at archeological sites in England, where it was widely believed to have magical healing powers. It was used to make varnish as long ago as 250 B.C. , and powdered amber was valued as incense. Amber was also traded throughout the world. By identifying the type of amber used in ancient artifacts, scholars can determine the geographical source of the amber and draw conclusions about early trade routes. During 19th century, scientific studies of the cellular structure of wood, found in amber, allowed scientists to come to the conclusion that coniferous trees were producers of amber. 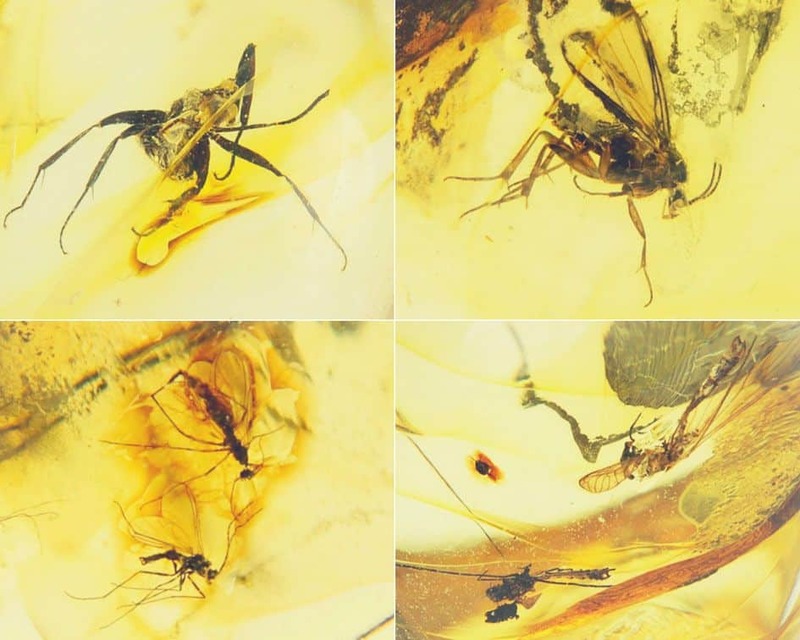 Plant inclusions found preserved in amber gave an opportunity to establish what other trees grew in the “amber” forest, and thus reproduce its appearance at the time when the formation of resin, which subsequently turned into amber, took place. If you want to know more about amber inclusions and discoveries made in amber, check our post. Eventually, those amber trees were dying off, falling to the ground or rotting on the root, while resin contained within was preserved and accumulated in the forest litter. Depending on the conditions in which this resin fell, further transformations took place. The one that found itself in dry, well-ventilated soil underwent polycondensation with the participation of oxygen. Its chemical stability increased and so hardness increased. The resin of the trees growing on the marshy areas was placed in conditions where it was not oxidized due to the lack of oxygen in the marshy soil overfilled with rotting residues, and therefore, it retained its fragility. 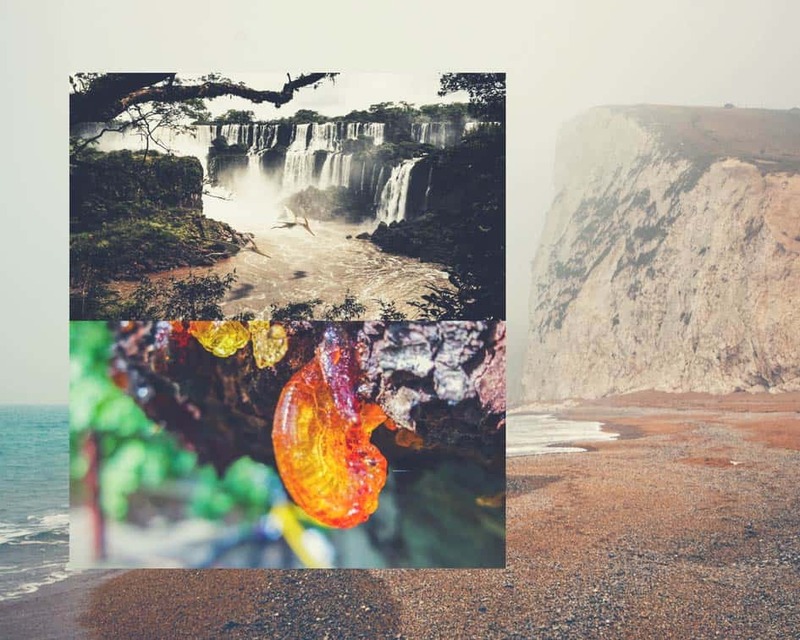 Later, these various resins were washed from the soil of the “amber” forest by water flows: they were carried by streams and rivers into the sea, where they were jointly deposited in the estuaries. Alkaline environment of bottom mud affected in some way the further chemical transformations of these resins. For example, the resin, washed and transferred from the dry soil, under the influence of the alkalinic bottom mud, turned into amber (succinite) – the one that, due to its beauty, sufficient hardness and machinability, is widely used in jewelry. Various combinations of conditions for the initial and subsequent burial of the resin, and possibly the differences in the producer trees, gave other types of fossil resins that are quite numerous. More than 60 species of amber-like fossil resins are known in the scientific mineralogical literature. Check our post on amber colors to learn more about the most famous types of amber. The main productive layer, in which amber is abundant, is the so-called “blue ground” or “blue earth”. This layer got its name due to the high contents of glauconite mineral, giving it a bluish-green hue, which, in general, is not very obvious due to the prevalence of dark gray earthy tones. The layer of “blue ground” with a thickness of 2 to 12 meters lies at a depth of 43-50 meters. On the seabed, it is exposed and is destroyed during storms. Part of the amber contained in it is emitted by waves to the shore, another part is redeposited in a different place along seabed. The free collection of amber had continued until 13th century. Specifically, till 1308 when Gdansk came under the rule of the Teutonic Order. The Order enforced state ownership of all amber found on lands under Prussian reign, penalising the withholding of amber finds even with death. The one, who dared to break the amber monopoly of Teutonic Order was subjected to cruel punishment by the so-called “amber court”. It was even forbidden to walk by the sea side. The Knights ruled with an unyielding fist. Anyone caught with a piece of amber that was not part of a rosary was subject to severe punishment and, often, hanging. Art prints (lithographs) from that time commonly depict amber fisherman portrayed along with gallows, a grim warning to all who would appropriate amber for themselves. Apart from rosaries, the Order’s craftsmen created other objects of religious nature, such as sculptures of Catholic saints. If you want to know more about the histroy of amber in different countries, check our Ancient Amber post. 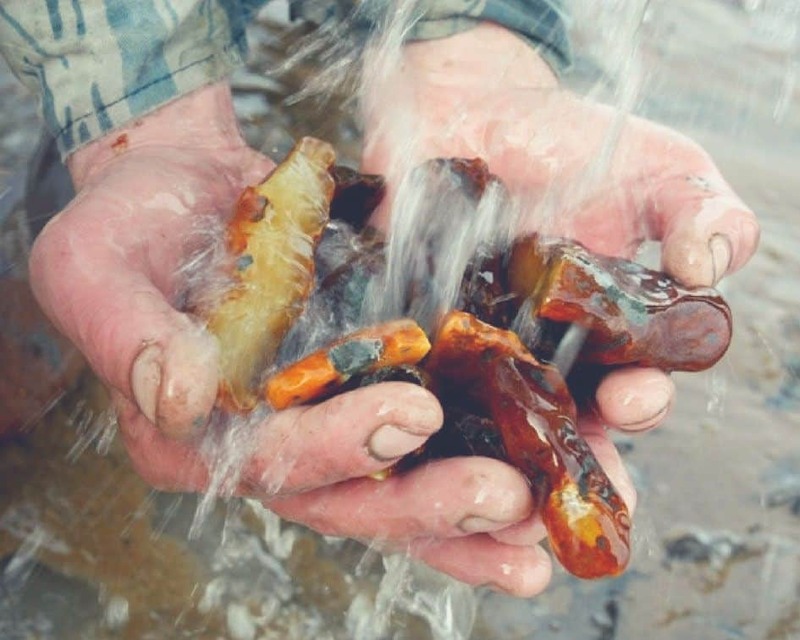 Starting from 16th century in addition to the collecting amber on the beaches, the new method of obtaining amber – catching, was widely spread. 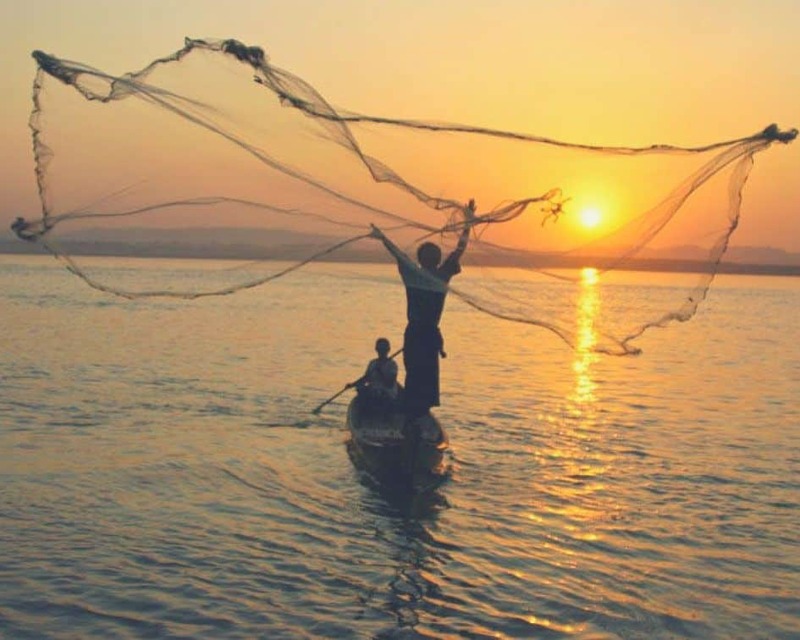 The hunters, equipped with the big nets on six to eight-meter sticks, went into the water or to sea by boats and, using their equipment, fished out the seaweed with the amber stuck in it. Somewhat later, they began to practice scooping up amber directly from the seabed by means of special devices: ticks, scrapers and etc. Scooping was usually done from the boat and in calm weather. The first mentions of the surface amber extraction are referred to the middle of 16th century. The people dug the pits at the shore, and, if there were the grains of amber in the ground, the bottom was delved further – till the subsoil waters. The amber pieces were emerging on the surface. In the middle of 17th century there were the attempts to excavate amber from the shore’s steeps. Since the beginning of the 17th century and especially during the 19th century, when diving costume was invented, divers simply collected pieces of amber from the bed of the sea. The first attempts to dive amber were a complete failure and for some time following method was left behind. 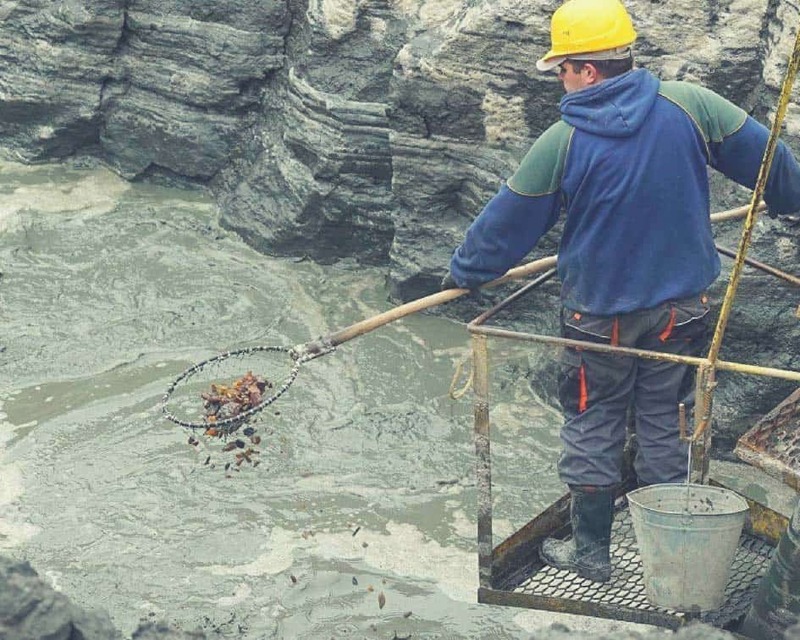 However, the repeated attempts udertaken in 19th century to extract amber from the seabed by divers were way more succesfull and for some time this mining method was one of the most progressive. This method lasted for 20 years and came to naught due to depletion of production areas of the sea. Since then, amber extraction is mostly made by mechanical means in industrial quantities. 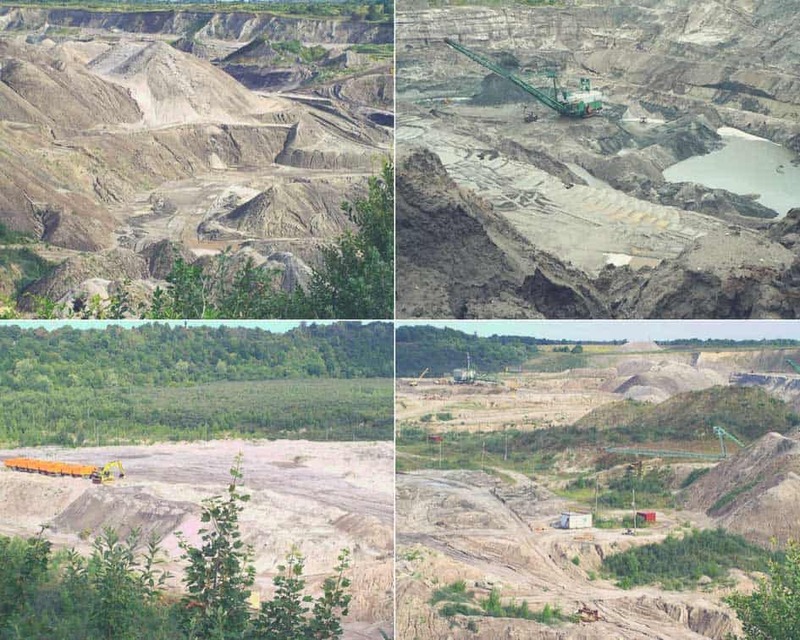 The first mine for industrial production of amber on land was laid in 1781 near the present village of Sinyavino in the Kaliningrad region, but after 7 years it was closed due to unprofitability. However, in the middle of the 19th century, dredging machines appeared that helped mechanize the extraction of amber and significantly influenced its increase. altering the structure of the soils, formation of cavities and a negative impact on the environment. The extraction of amber is developed in those countries where its industrial production is in place. Therefore, studies held in those countires has as its aim to reduce negative consequences of the application of extracting equipment on natural environment and substantiation of rational parameters of mining equipment to maximum extraction of amber from amber-containing fields. Nowadays the amber extraction is carried on in the open-cast mines, being a composite, highly-mechanized production. Originally the over-burden layers were exploited by excavator, and were transported in the slag-heap by rails. 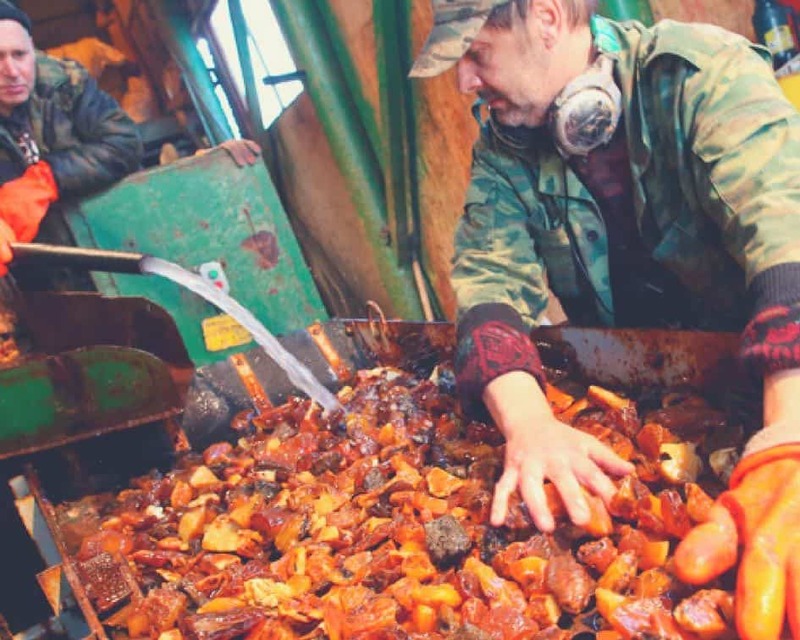 Before 1995 the blue earth, containing amber, had been extracted by the chain-bucket excavator, and then transported to the concentrating mill using a belt conveyer. Nowadays, in order to preserve the amber in a good state, the method of hydro-mechanization has been used; and the amber has been transported by pipeline. It worth saying that different factories at different amber production sites can apply some modifications to the amber extraction process, but in general it looks more or less the same. To explain you in detail, we will use as an example, the amber mining process used at amber production plant at Kaliningrad (Russia). 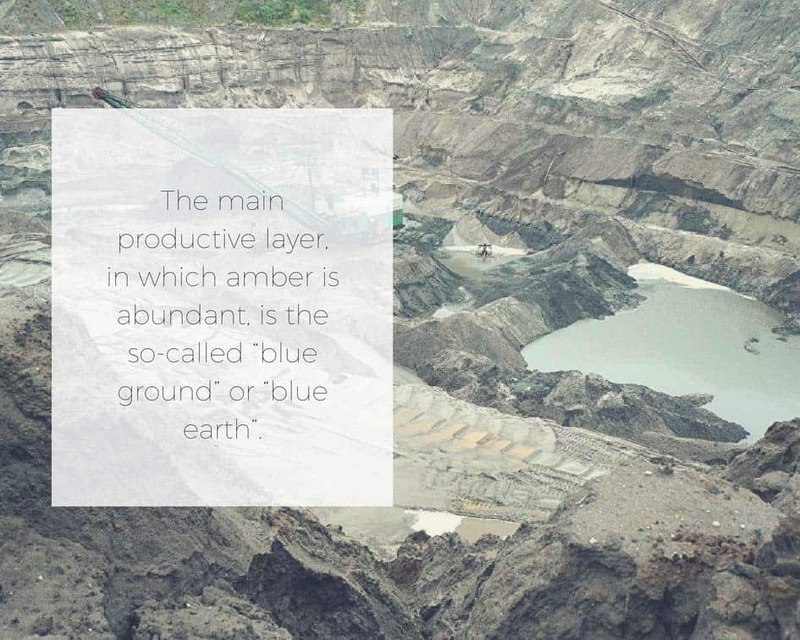 The blue earth, which was washed away by the water, is going to the amber factory through the grate with meshes 5 cm in diameter, where the workers are picking out the biggest pieces of the mineral. Then the most part of the barren rock, having gone through the sieve with the 2mm meshes, is going to the waste. The material, which has remained, is passed through the system of arc sieves, where it goes through its initial washing and dehydrating. Then, in the separator, this mass is exfoliated in a special solution of a density lower than amber; the heavy fractions are accumulating at the bottom, and the small amber as well as pieces of wood emerge at the surface. The amber, separated from admixtures, is delivered to the sifter – the system of sieves moving in opposite directions, with the meshes of different diameters, which are located one above the other. By means of vibration the amber is sifted and divided into three fractions, depending on the size. All extracted raw amber falls into the following categories: amber for jewelry production and amber for industrial purposes. Industrial amber is usually of fine fraction, black and of no interest to goldsmiths. It is used for producing high quality varnish and as well as musical instruments and car varnish of premium class. Another method, used mostly for exploration of new deposits, geological exploration and industrial development is called a screw-hydraulic method and its main advantages are the ecological purity and efficiency. Extraction is made by auger drilling. The rock is rendered with hydraulic pressure and carried to the surface in the form of pulp. Then the pulp enters a special installation, where it is washed. The rinsing water, in turn, returns to the sump, where it is again cleaned and re-used. So, in the technological process, circulating-return water is used. It serves both to extract amber and to wash it from sandy-argillaceous rocks. 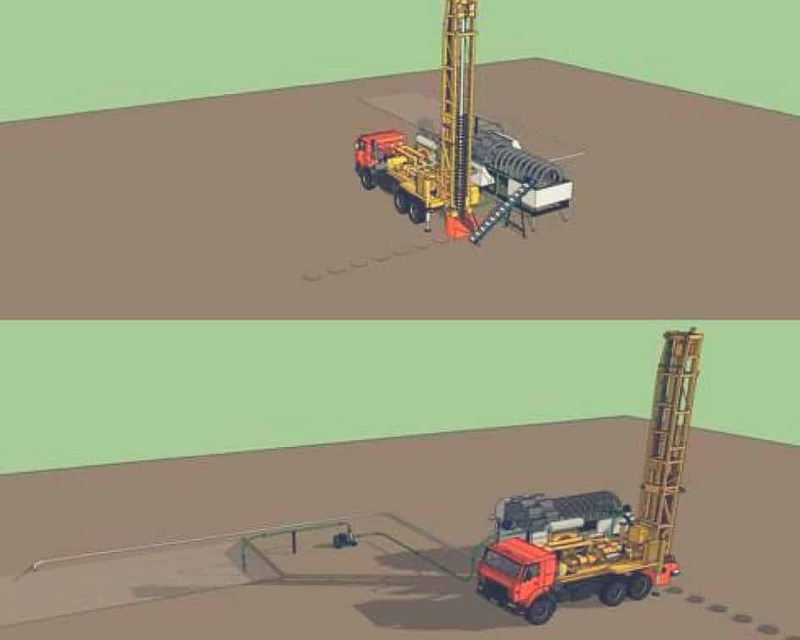 The complex equipment consists of a mobile washing machine on wheels or sledges, a self-propelled hydraulic installation on a caterpillar or pneumatic track, a water tank for 5-8 m3 and a tubing equipment. Such installations are usually served by two specialists. In countries like Ukraine, where amber in layed closer to the surface, this exytaction method is more widely used than the one mentioned above. But the most interesting part about amber is that even you can try extracting amber! 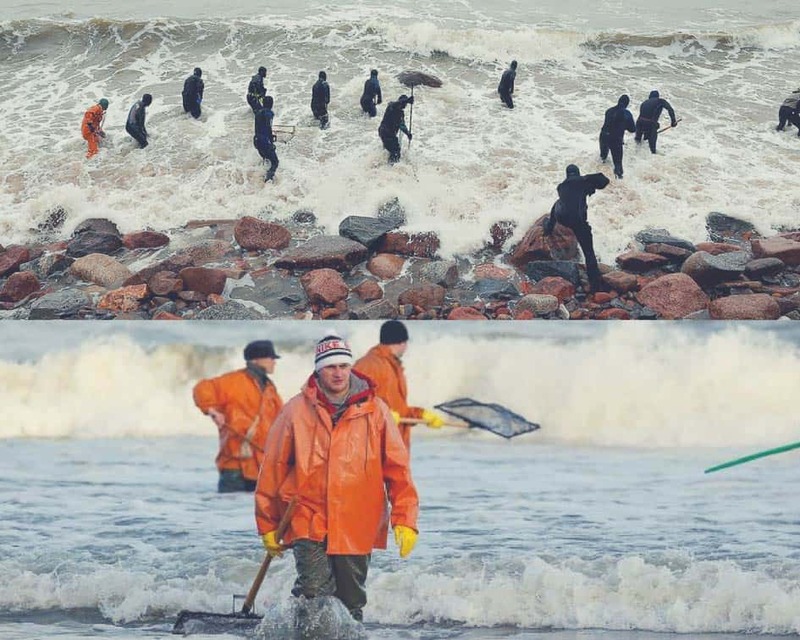 At the shores of the Baltic Sea and the North Sea, amber can be found after storms (if they came from the right direction), and during low-tide. In spring, autumn and especially winter seasons the density of salt water is slightly higher, so that amber swims, being caught in seaweed which then can be driven to the beach, by current or waves. Scour up the beach. Amber will feel warm to the skin because it is an organic material and if you click the “stone” against teeth, it will not click like a mineral, but rather like plastic. Good luck! 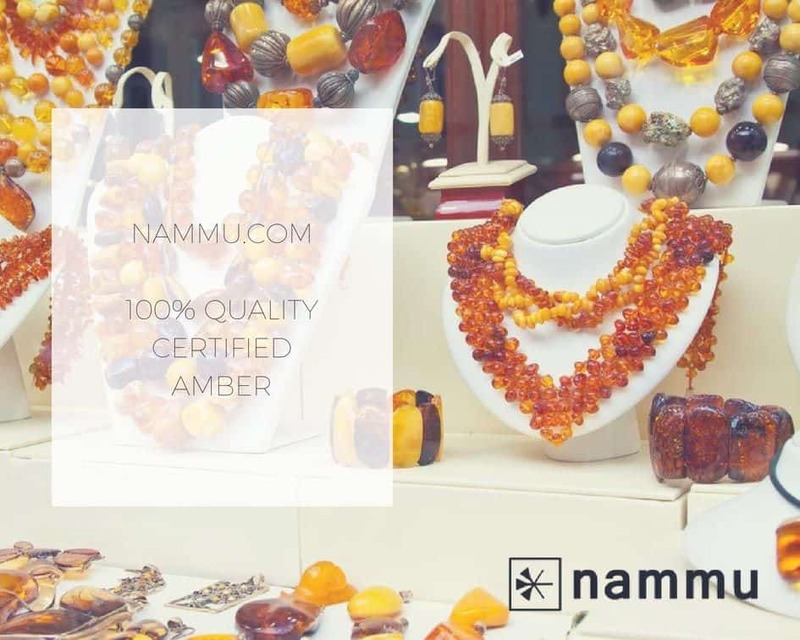 Or you can always buy amber at Nammu, where you will have only the best Baltic and Ukrainian amber jewelry. Thank you a lot for your kind words! It is a great pleasure to write for people, who approve, appreciate and like what you’re doing! We, at Nammu, are continuously doing our best to become more popular, so we can share our love to amber and lapis lazuli with even more people around the world. Good luck to you and wish you all the endless health and happiness!